For some reason, when it comes to German cuisine in Orlando, your choices are pretty limited. The old stand by, and of my favorites Bauern Stube has always been consistently good, but its location on the other side of Orange avenue can be a bit of a journey sometimes. Of course over in Sanford there is the very popular Hollerbach’s Willow Tree Cafe that is also one of my favorite restaurants, but again it's in downtown Sanford. 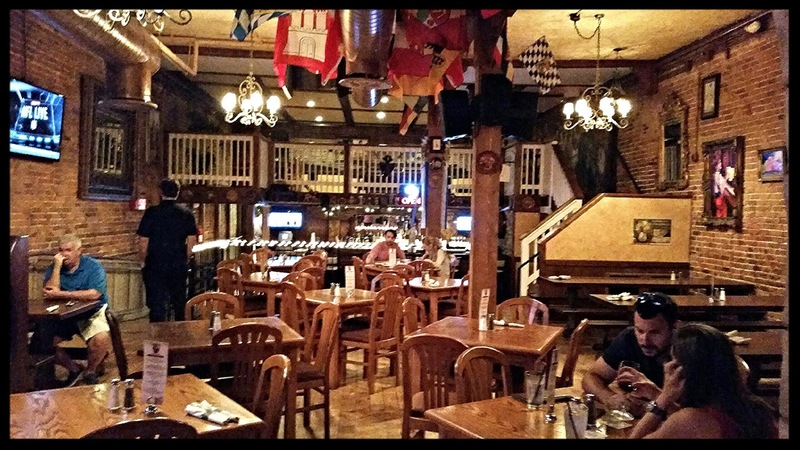 Now there is a third option for all of you German food aficionados out there… Schumann’s Jager House. Schumann’s has quite the ideal location in the heart of downtown Orlando and is easy to get to for the most part. Schumann’s is the brainchild of the Mulvaney brothers who have been residents of Orlando since the early 1980's, and have owned and operated more than a dozen Irish Pubs in Florida throughout the years. This new venture takes a trip to Germany as a way to honor their step-father Ernie Schumann. Chef Ralph Oliver is the executive chef at Jager Haus and he has years of culinary arts study and has been an Executive Chef with some of the most prestigious restaurants in Central Florida. Chef Ralph came to Schumann’s with hopes of contributing some great culinary treats to the ‘new’ Church Street and downtown revitalization. The menu has all of the stuff you would expect at a German restaurant. Bratwurst, Knockwurst, Schnitzel, Potato Pancakes and various entree selections. 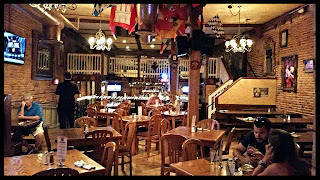 The inside of Schumann’s is very well done and decorated with the feel of an old world German beer hall and lodge. Jager Haus translated is Hunter’s House, and the interior here definitely gives off the vibe of a place one would enjoy fine German beers and freshly cooked meats after a day of hunting. Köstritzer Schwarzbier is a dark beer that maintains a dark, rich color with a roasted aroma that contributes to its malty taste and a creamy finish. The Schumann’s Sampler consists of Bavarian Brezen (Soft Pretzel), Frikadellen (German Style Meatballs), Kartoffelpuffer (Potato Pancakes) and comes with a variety of condiments and toppings. This a good way to get your taste buds ready for the flavors of Germany. Jäger Schnitzel is a Breaded Pork or Chicken Cutlet with Mushroom demi glaze and a choice of two sides. You may also request, as I did to have it with veal. I chose mashed potatoes and green beans for my sides. My schnitzel was very tender and flavorful, and the mushroom demi glaze was excellent as well. Bratwurst at Schumann’s is made with coarsely chopped pork and beef with blended natural spices. My dining companion chose Spatzle and red cabbage as a side. The Traditional Reuben features corned beef, sauerkraut, gruyere, Haus-made dressing and is grilled on rye bread. This sandwich was pretty good, and Schumann’s has a few more listed on the menu in case you or someone in your dining party wants something a little less German. Of course, no visit to a German restaurant with a good beer selection is complete until you get Das Boot. The famous drinking apparatus holds just about 3 litres and is a great way to get the party started at your table. We filled ours up with Schöfferhofer Hefeweizen wheat beer. Some German restaurants are very strict on the old law that says you can never put it down once it comes to your table. It is believed to be bad luck if it touches the table before it is emptied. Our server John kept a watchful eye on our party of four, but told us it was ok if we needed to sit Das Boot down for a breather. You will need to hand over a credit card during the experience for Schumann’s to hold, just in case you accidently drop and break the boot. That will set you back $150. Overall, we had a great time and really enjoyed the food. Our server John was very knowledgeable and quite entertaining on a Friday evening. As I mentioned earlier the decor and layout of Schumann’s is very cool, and really helps to set the mood for your dining experience. I will definitely return for some more gute zeiten at Schumann’s and recommend you to try them out as well.